There is nothing better than paddling out onto an open lake on a hot day with a cold beverage in hand. Having a compact cooler that is lightweight enough to be packed in your kayak will provide endless opportunities. Not only can you pack a light snack along with you but they are also a popular option for those looking to start fishing. The best kayak coolers will go with you wherever you take them. Having the best kayak ice chest can be all you need to take a good day on the water and make it excellent. Bringing cold drinks along on your trip to the lake and enjoying them while you cast a line with the sun beaming down on you, there are few things better. Due to this top rated kayak cooler’s zipper, it is guaranteed to be leak proof. 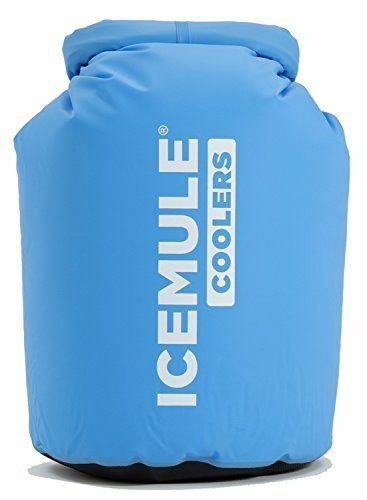 This soft cooler for kayaking can hold up to 16 cans and loads of ice. 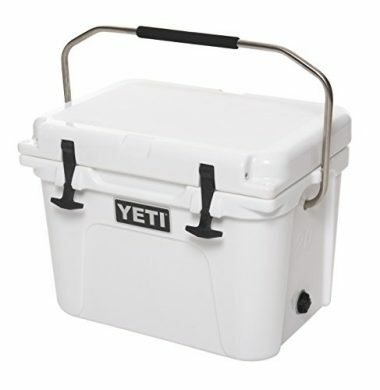 Unlike other soft coolers, this Yeti cooler uses a closed cell foam. This makes the contents stay colder much longer than a typical cooler. In fact, it can keep your drinks and food for an entire day. It also creates a waterproof system that is resistant to mildew, punctures and abrasions. If you are looking for the most durable soft cooler system the Hopper Flip Portable Cooler should be near the top of your list. 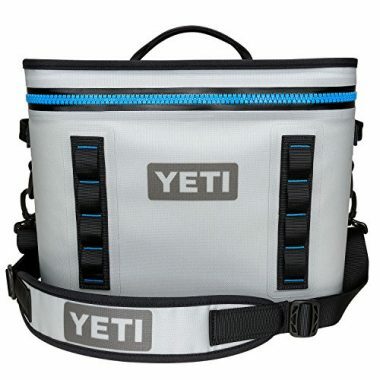 Yeti is one of the leaders of the industry when it comes to coolers. Not only do they use the best materials possible but their build quality is also second to none. The Roadie 20 Cooler will be able to hold up to 14 cans. Yeti recommends that you have a 2 to 1 ratio of ice to contents. This will ensure the cooler keeps all your stuff at the optimal temperature for as long as possible. The Roadie has 3 inches of Permafrost Insulation and specially designed handles that make the entire cooler bear resistant. This is due to the Rot molded Construction, T-Rex Lid Latches and heavy duty rubber. IceMules Coolers continues their high quality line with their Classic Cooler line. This option is a floating cooler for kayak. 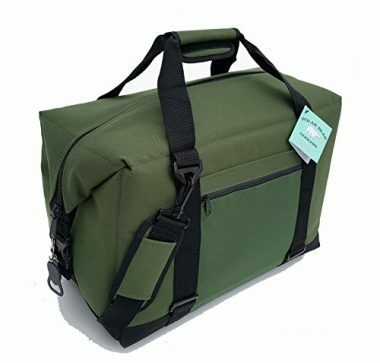 It has a padded backstrap which makes transporting it super easy while it’s guaranteed to keep your gear cold for at least 24 hours. AO Coolers is one of those lesser known brands that impresses you. Their kayak cooler comes in a 12, 24 36 or 48 can variations. It comes with a removable shoulder strap which makes it easy transportable to and from your kayak. What makes this such a good cooler is that it’s guaranteed to keep ice solid for 24 hours in 120 degree weather. This makes it perfect for weekend kayak trips. It can even keep your food hot as well! Polar Bear Coolers have made a top of the line soft kayak cooler bag. It comes in 12, 24 and 48 can variations and can keep your contents cold for at least 24 hours (when packed properly). This is due to its rugged 1000D nylon material that has been designed to never rip, scratch or tear. The zipper has also been reinforced and deemed unbreakable by YKK. This company believes in their product so much that they offer a limited lifetime warranty and guarantee it to be leakproof and sweatproof. 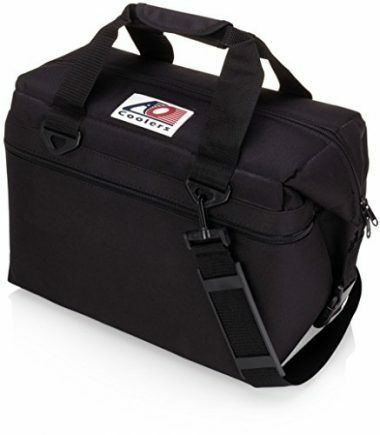 This cooler bag also comes with an adjustable padded shoulder strap which makes carrying this bag a breeze. You can even have your bag custom embroidered. Just send them what you want it to say and they’ll stitch it for you. The bag can even be easily stored as it can be folded and tucked away for when you need it. 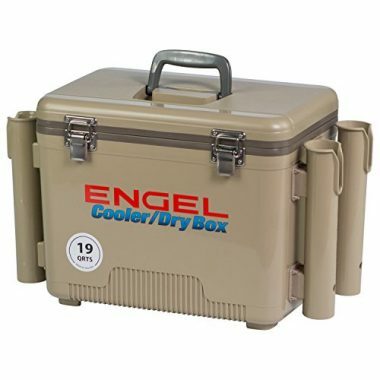 Engel is one of the best when it comes to keeping stuff cold. Their cooler boxes are some of the most sought after systems on the market. This 19 quart cooler/dry box can hold up to 12 cans and loads of ice. An airtight system which includes EVA foam and a rubber gasket ensure your stuff stays as cold as possible for as long as possible. What makes this setup stand out is that it comes with 4 rod holders. They are built into the cooler and are both durable and removable. Everything about this screams high quality, even the stainless steel latches and molded polystyrene insulation. This is an ideal kayak fish cooler. Stanley as a company have been around for ages. 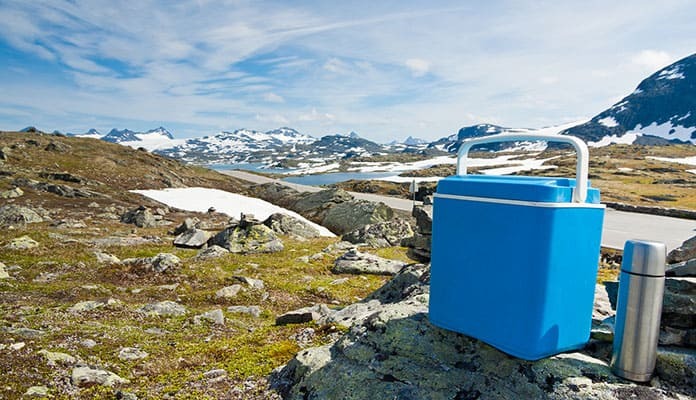 Their Adventure Cooler has double wall foam insulation which when combined with a leak resistant lid, keeps your food cold for up to 40% longer than a typical cooler - up to 36 hours in fact. This kayak hatch cooler can also store up to 21 cans which is one of the most in its class. It also has strong and well designed latches and hinges. Being able to have a watertight seal is a key aspect of a soft shell kayak cooler. It will allow you to fill it with ice and ensure that it says inside even as it melts. 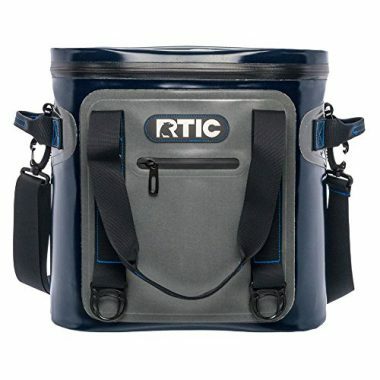 This RTIC option can hold up to 40 cans with enough room for ice. It also has the sought after no leak zipper along with 2 inches of foam insulation. This is pointless if it’s delicate, something that this kayak cooler is not. It has a puncture resistant layer on the outside and an antimicrobial liner on the inside. 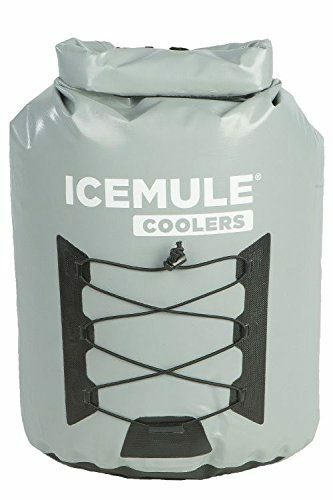 IceMule Coolers have created one of the most portable kayak coolers. It’s not only easy to strap to your kayak but will perform when you need it. Your food and drink will stay cold for at least 24 hours and is guaranteed to not leak. It is also has backpack straps so you won’t have to make an extra tip just for this bag. The Pro Cooler is a 20 liter option that can carry up to 18 cans. The one piece roto-molded polyethylene materials provides a rugged durability that is exceptional for outdoor use. The walls of this cooler are extra thick which helps to provide superior ice retention. Simply put, your cooler will stay cool for loner. The lid has latches that help to secure it closed making it ideal for travel. A padded shoulder strap makes carrying this kayak easy and comfortable. The SURE grip rubber feet help it to stay securely in place while you are paddling making it a superior option for kayakers. Weighing a mere 14 pounds this cooler is superior for kayak use. Compact enough to bring on board of almost any boating trip it is clear to see why this kayak has been so highly rated. 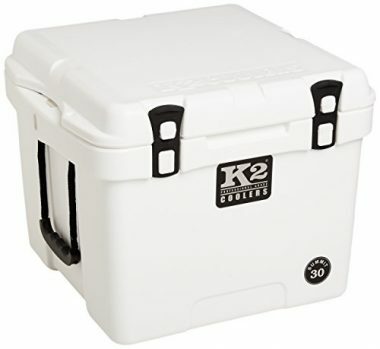 In fact, K2 Coolers is so confident you will love it they have included a 7 year warranty on their product. 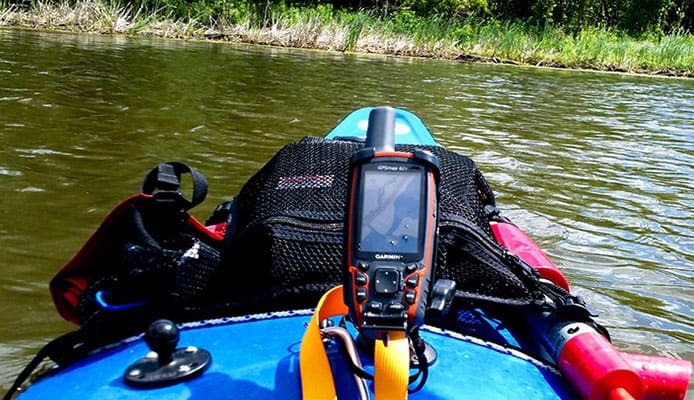 Kayak cooler reviews agree that there are features that your gear should have. You have far more options than you may realize allowing you to be extra choosy in finding the ideal cooler for you. Mostly this will depend on the space you have with you in your kayak as well as what you plan to use the cooler for. Regardless, you will want to pay attention to the following features. First things first, how much are you looking to bring with you. This should be one of the first questions you ask yourself. 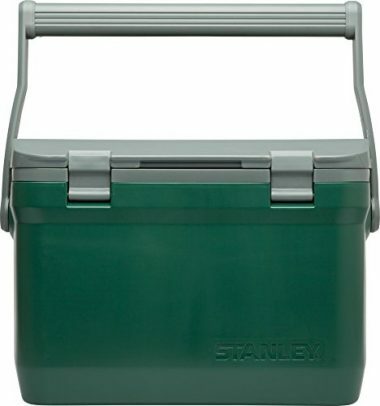 Are you looking for a small cooler that will hold a few cans and a sandwich or are you looking for something heftier that will hold enough for a couple nights camping? Or, are you an avid fisher who is looking for a way to keep their catch as fresh as possible? Companies typically always reference the capacity of their coolers in terms of quarts. If not, this will be referred to in terms of cans or liters. The capacity of different coolers will vary quite drastically. You will find that on average a 10 quart cooler fits nicely in most kayaks and will suit your needs quite nicely. Coolers vary in materials drastically. Most often the biggest variance will be whether your cooler is hard or soft. There are pros and cons to the different styles. Hard coolers are made out of firm plastics or rubber materials. These are ideal for those who are really rough on their gear as they are often more watertight and will protect the stuff you put inside. Soft coolers are made out of cloth materials that are laminated and insulated. These are ideal as their form is flexible and can, therefore, fit into a variety of different spaces. They are also ideal for their lightweight feel. This is one of the most important parts of a cooler. After all, what good is your cooler if it doesn’t keep your stuff cold? The cooler you are choosing should be insulated enough to keep the ice and other cold products you put in there cold or frozen. The cooler you choose will likely advertise this quality in terms of hours it is rated to keep cool. Quality coolers should keep cool for anywhere between 24 to 72 hours. While you likely don’t need this long, it is important to realize that when out on a lake you will have direct sunlight hitting it which will decrease this time. Opting for something on the higher end of this spectrum is a good idea. Typically having a waterproof cooler is likely not something on your radar. When you are looking for one for use on a kayak, it really should be. Most coolers you will come across are waterproof. Higher quality coolers will be leak proof, and air tight as well. 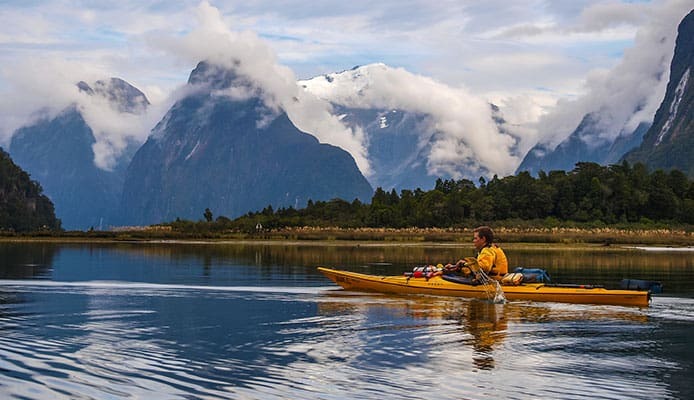 This is particularly ideal for those who are kayaking as you will find yourself in wet and unpredictable situations. Particularly for fisherman, having a drain plug is important but you will want to make sure that this doesn’t leak. When purchasing your cooler, as well as when you are caring and maintaining it, you will want to ensure all O rings and gaskets are clean and intact without issues. These parts can almost always be replaced if faulty but can cause quite a mess if not found in time. Q: What size cooler for kayak? A: This is not an easy question to answer as it depends on your use, kayak size and personal preference. Consider the length of trips that you intend to be using your cooler for. Overnight camping trips will require a larger cooler than that used for a few hours out on the lake. Regardless of the size you choose, be sure to measure your kayaks storage compartments before purchasing to ensure a good fit. 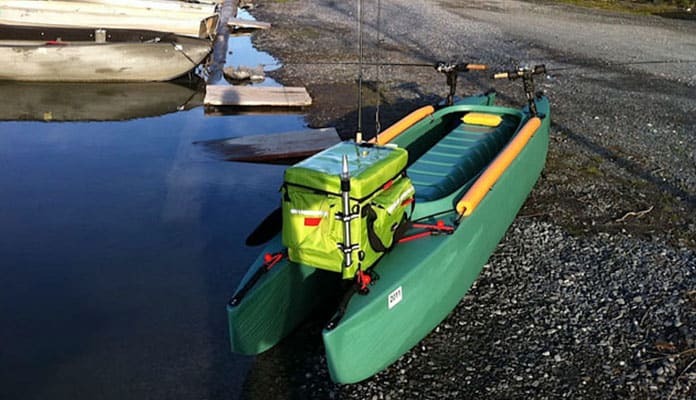 Q: How to attach a cooler to a kayak? A: There are many different ways to attach a cooler to a kayak. A soft cooler will be easier as it can conform to the space it sits in. If the cooler is larger than the space it can bend a little to accommodate the space. Rigid coolers will have to be strapped to the rigging of your kayak. Q: How to take cooler on sit on kayak? 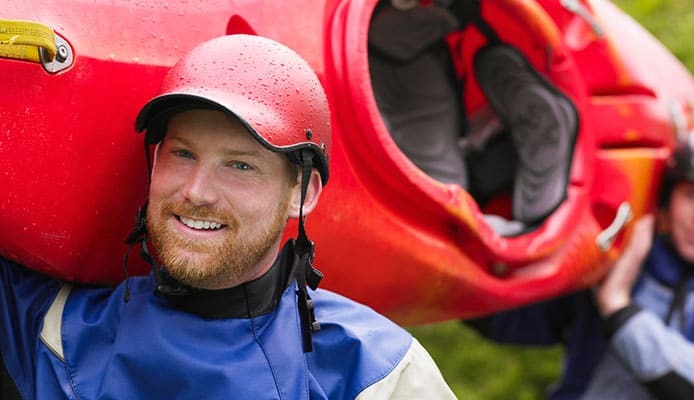 A: Sit on top kayaks actually have an easier time fitting coolers. They have much more storage that has a flat area which makes it easier to fit it on your rig. Just keep in mind that you have a higher center of gravity on this type of kayak. This means you will have to be cautious about how tall your cooler is as it can cause you to tip in rough waters. When it comes to a hot summer’s day out on the water, having a quality cooler is sure to make your time more enjoyable. Sit back and enjoy a cold refreshing drink when lazing on a lake or be able to go for longer overnight camping trips with the best cooler keeping your foot cold. Do you use one of the kayak coolers on our list for your day on the lake? Let us know how you like it in the comment section below.